We’d love your help. 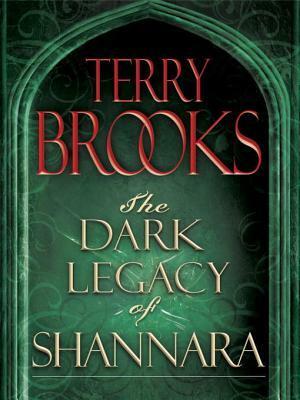 Let us know what’s wrong with this preview of The Dark Legacy of Shannara Trilogy by Terry Brooks. Also includes the Paladins of Shannara short stories: “Allanon’s Quest,” “The Weapons Master’s Choice,” and “The Black Irix”! When the world was young, the power of magic ruled—and the Elfstones warded the race of Elves and their lands, keeping evil at bay. But when an Elven girl fell hopelessly in love with a Darkling boy of the Void, he carried away more than her heart. To ask other readers questions about The Dark Legacy of Shannara Trilogy, please sign up. I did enjoy it, but overall, The Dark Legacy of Shanarra is the series’ weakest entry thus far, even if Oriantha and Tesla Dart are my favorite characters in the whole mega-series so far. I enjoyed listening to it, and Rosalyn Landor is a top-notch narrator. Like all of Brooks’ books that I have read, it moves swiftly and provides a good adventure; this accessibility and adventure is, in fact, the main reason I keep reading Terry Brooks. On the other hand, Dark Legacy is definitely the most mixed I did enjoy it, but overall, The Dark Legacy of Shanarra is the series’ weakest entry thus far, even if Oriantha and Tesla Dart are my favorite characters in the whole mega-series so far. I enjoyed listening to it, and Rosalyn Landor is a top-notch narrator. Like all of Brooks’ books that I have read, it moves swiftly and provides a good adventure; this accessibility and adventure is, in fact, the main reason I keep reading Terry Brooks. On the other hand, Dark Legacy is definitely the most mixed of the series I have read so far, with some really good bits, some downright dire moments, and a sense of opportunity wasted. Just so you know: There are definite spoilers for the trilogy below. Let’s face it: This is basically Elfstones of Shannara retold in three-book format, complete with dying Ellcrys, misused Elfstones that are changing the protagonist, an unidentified shape-shifting spy, a demonic invasion, and a quest for the Bloodfire. This is not, in and of itself, a bad thing: It offers Brooks the chance to complicate matters a bit and to point out that, perhaps, the original people of Faerie were a little too quick to banish entire nations and peoples to a wasteland without hope of return. To an extent, he does so, giving the love story between Aleia Omarosia and her “Darkling Boy” as one powerful argument that the peoples were not so different and the guide Tesla Dart for a more nuanced look at the group. This premise is largely wasted, however, as aside from those two individuals, everything in the Forbidding is, in fact, trying to kill the heroes, usually very unpleasantly and apparently mindlessly. Mostly, everything there looks evil as well. Once the Forbidding opens, the result is an immediate invasion by Tael Riverine (not mindless) and his hoards, all of whom fling themselves at whomever they are fighting with the same careless regard for life and limb as their predecessors did in Elfstones and who bring the same waves of destruction. With no indication that some diplomatic alternative was possible or any other outcome likely, the moral ends up being “Yes. Lock them all away.” Granted, Brooks might follow this up in a future trilogy, but this was a giant, three-book chance that didn’t get taken. The character development is superb. The plots run very smoothly. The writing it getting predictable and by a formula. The fantasy lasts only for so long. If strong female protagonists are your cup of tea you'll enjoy this book. Die hard Shannara fans will always enjoy this book. The land of Shannara is getting boring for me. This is an engaging trilogy of books. It was enjoyable to read, not overly predictable, with well-developed characters. I found it more expertly written than the original trilogy in the series. Suitable for teenagers. Now if you would only get a kindle omnibus version of the Word/Void together so I could read it on long car rides. Loved the extra short stories in here too. again brings Terry bRooks us in the kingdom of Shannara, where this time magic and science seem to battle. Terry Brooks was born in Illinois in 1944, where he spent a great deal of his childhood and early adulthood dreaming up stories in and around Sinnissippi Park, the very same park that would eventually become the setting for his bestselling Word & Void trilogy. He went to college and received his undergraduate degree from Hamilton College, where he majored in English Literature, and he received Terry Brooks was born in Illinois in 1944, where he spent a great deal of his childhood and early adulthood dreaming up stories in and around Sinnissippi Park, the very same park that would eventually become the setting for his bestselling Word & Void trilogy. He went to college and received his undergraduate degree from Hamilton College, where he majored in English Literature, and he received his graduate degree from the School of Law at Washington & Lee University. A writer since high school, he wrote many stories within the genres of science fiction, western, fiction, and non-fiction, until one semester early in his college years he was given The Lord of the Rings to read. That moment changed Terry's life forever, because in Tolkien's great work he found all the elements needed to fully explore his writing combined in one genre.